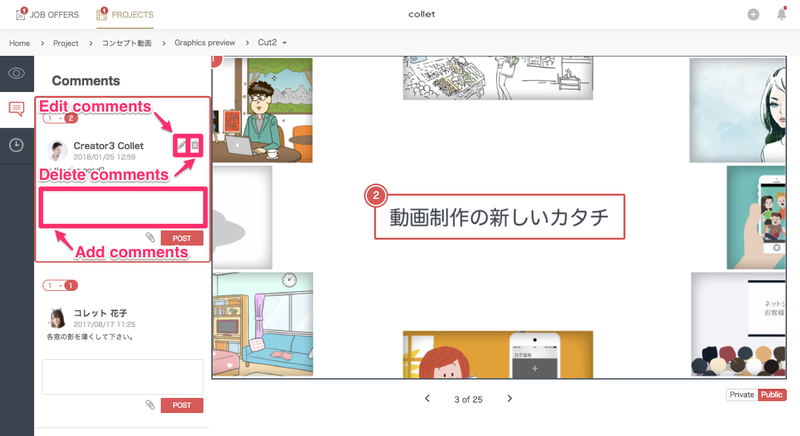 This is how to share graphics with Collet users and receive feedback (comments). 2.Choose the project you want to upload graphics. 4.Drag and drop the graphic or click "Drop to add scene" to add the graphic from your PC files. *Graphics are private to client when you uploaded. You can check comments on left of the graphic if you open the graphic you want to check comments. You can add comments to the graphics. 1.Select the point you want to comment by clicking or dragging. 2.Write comments and click "POST". You can edit, add and delete your comments. You can manage versions of graphics. 1.Click the clock mark one the left. 2.Click "Add revision" to add a new version. You can choose to make graphics public or private to the client. You can change the status by clicking "Private" or "Public" buttons on down right. The current status turns to red. Also, you can make a graphic public to client by clicking the icon shown below. You can download or delete a graphic.